There are currently 114,998 users on this website. 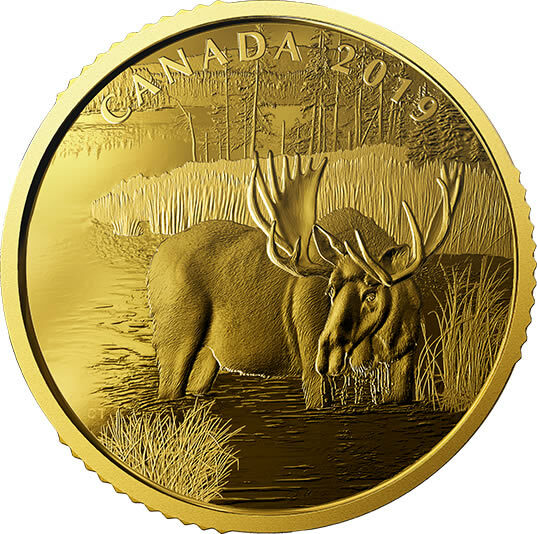 Royal Canadian Mint - Designed by Claude Thivierge, your coin is a one-on-one encounter with Alces alces in an idyllic setting. Partially shrouded in a blanket of morning mist, the forest basks in the golden glow of sunrise. A bull moose stands in the water near the grass-lined edge, where it quietly feeds on aquatic plants. Presented in a three-quarter view, the moose has turned its head towards the viewer, which brings its rack of antlers into full view. The reverse includes the engraved word "CANADA" and the year "2019". The obverse features the effigy of Her Majesty Queen Elizabeth II by Susanna Blunt.